When would-be businessman, Paul Margerison went to his local bank to ask for backing for an idea he had for selling hot tubs – he got more than he bargained for. Seven years on and Outdoor Living has just opened the doors to its second prestigious hot tub showroom; they have a customer base in excess of 3,000 and are selling the sort of numbers that would make most hot tub retailers green with envy. 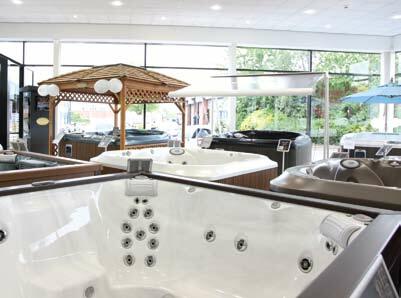 The Outdoor Living showroom in Hull stocks a combination of Arctic, Artesian and Jacuzzi spas from an outstanding location on a busy road that sees about 60,000 cars pass by daily. 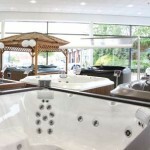 A second showroom, now open in Leeds, is a dedicated showroom selling only Jacuzzi product. “Jacuzzi is simply the only hot tub brand that everybody knows not just in the UK but around the world,” says Kevin. It is a winning combination. The pair were named Jacuzzi Retailers of the Year at the recent UK Awards and employ a team of ten on sales, installation and service. “If you want to be big; you have to think big; it is simple really,” says Kevin, who reveals that hot tub sales represent only 25% of the company’s total turnover. but look forward to taking holidays in the quieter, winter months. Says Kevin: “According to official government figures, the recession finished on January 26, 2010.